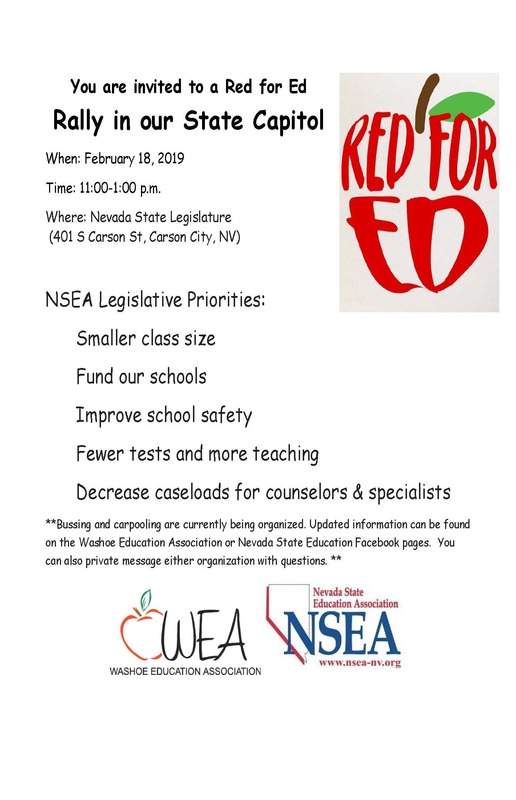 Please accept this as a personal invitation from your WEA Leadership to attend the Red For Ed Rally held on Monday, February, 18, 2019, in Carson City, at 11:00 AM. This is OUR opportunity to send a strong message to our legislators and the public that NOW is the time to increase funding for public education. While we will hold additional events during the 2019 legislative session, this rally will be one of the most important events as it will set the tone. The rally is for WEA members, non-members, family, friends, members of the public — anyone who supports more funding for our profession, our students and our schools. All are invited and encouraged to attend. Please plan on attending. For those who will be driving down in their own vehicles, but who would like to caravan to the rally, we will be leaving for the rally from the southeast parking lot of Wooster High School (1331 East Plumb Lane, Reno, NV 89502) at 10:10 AM sharp. Also, for those WEA members who would like to ride a bus to the rally, our sister association of WESP has reserved 3 WCSD school buses. In order to ride one of the buses, registration at the link sent in an email on Thursday, February 7th is required. Riding on the bus will be on a first come first served basis, based on those who register. We have ordered Red for Ed scarfs for the rally for our WEA members, and we will be handing out the scarfs at the Wooster HS parking lot prior to leaving for the rally. WEA members may also come by the WEA building after school on Thursday, February 14th, and pick-up scarfs for the rally, and Building Representatives may also pick-up scarfs at the WEA building for those WEA members who will be attending rally. Scarfs will be available on a first come first served basis for WEA members who have registered by Thursday, February 14, 2019. Again, we are asking that all WEA members who will be attending the rally to register at the link in the THursday, February 7th email, and that they register no later than Thursday, February 14, 2019. The rally begins at 11:00 AM in Carson City at the Capitol. The buses will be returning from Carson City at 1:00 PM (should arrive back at the Wooster HS parking lot at 2:00 PM). Registration for the event will allow us to update members on the agenda/other helpful items.